Nestled between the wooded slopes of Mont Royal and the cosmopolitan bustle of downtown Montreal, McGill University is a place energized by difference. You can hear it in the languages spoken in its hallways and classrooms. You can see it in the cutting-edge facilities rubbing shoulders with storied heritage buildings. You can feel it when talent and ambitions come together in a culture that nourishes thinking and informed debate. McGill University with a student population of 36,000 has impressive credentials. It is ranked 17th in the QS World University Rankings, it is made up of 19% international students, 23% graduate students, it has the Highest percentage PhD students of any Canadian research university, 180 countries where alumni live and work, 8 Nobel laureates (6 alumni, 2 academics), 132 Rhodes Scholars — the most of any Canadian university. In September 2008, McGill opened the then new 193,000 square foot Bellini Life Sciences Complex. For this story the main interest is in the use of electric metal radiant ceiling panels. These Architectural Series heaters are an ideal fit for this building and show the depth and possibilities of its uses. The Life Sciences Complex is sited adjacent to one of the most cherished green spaces in Montreal — the upper slopes of Mount Royal. The sensitive context, coupled with the University’s sustainable building mandate and the architects’ commitment to reducing the ecological impact of architecture, helped to establish the design team’s goal of constructing an unobtrusive energy efficient building. The new Bellini and Cancer pavilions are designed to achieve LEED Gold certification with the Canadian Green Building Council. Each energy conservation measure was considered individually, based on a 10-year payback benchmark. Overall, the total building will use 53kwh/sq ft annually, 36% more efficient than the Canadian National Model Energy Code reference building. The primary function of the McGill University Life Sciences Complex is research in cancer and biomedicine. This includes five key components: chemical biology, complex traits, developmental biology, cell information systems and cancer research. and a core equipment facility centrally located between the two wings of the complex that is configured to allow the users to share access to expensive equipment. These core spaces are provided http://www.onlinepharmacytabs.com with electrical and mechanical service that will allow upgrades to equipment to take place with a minimum of disruption to other ongoing research activities. How to take advantage of the natural light. The problem with an all glass building is that occupants sitting next to the glass are cold in the winter. What happens is you lose your body heat to the glass. So you either call maintenance for more heat, which usually never works, or you throw on a sweater. Ask any building maintenance facility manager about the complaints he gets from this scenario. It’s even worse when you’re responsible for a four-sided building. The south side is too warm, therefore the air conditioner kicks in (or not) and the north side is too cold. With a central system, you can’t possibly please anybody and now you’re inefficient because of conflicting heating/cooling demand. By separating the heating from the cooling system, each can perform at its maximum efficiency when and where needed. Attacking the comfort challenge was the first priority. After being contacted by the engineers it was agreed that an electric radiant heating system would solve the heat loss at the glass perimeter. This was done in a previous project in Ottawa where the atrium was 21 feet high and the panels were used to this effect. Determining the heating load was easy. It was decided that the panels should be installed part way into the laboratory space rather than at normal ceiling height. This caused a secondary problem. The backs of the heaters were now exposed and both its aesthetic looks and lack of light reflection were problematic. 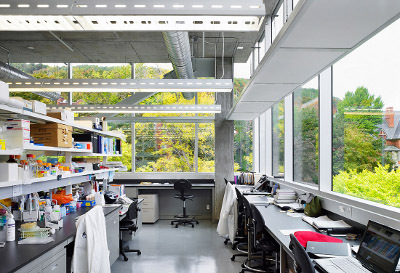 Providing abundant natural light in the laboratories was the foundation of creating a satisfying work environment. A rather unique solution was arrived at. The junction box on the back of the heater was re-positioned to the side so that wiring could be easily done and it would be hidden by the frame. Then the backs of the panels were painted white, allowing sunlight to bounce off them. Et voila, a light tray. Problem solved. In understanding how radiant heat can address the heating problems of glass perimeter buildings, the goals of this green building were met. It demonstrates that a heating system neither needs to be expensive nor intrusive in a working environment. While blending with the architect’s vision, it also solves the engineer’s dilemma on how to efficiently and comfortably heat these types of spaces. Contrary to misconception — electricity is green when used in a radiant heated system. Oh yes, the maintenance facility managers appreciate it too.